Then-Toronto Argonauts head coach Marc Trestman looks on during the second half of a game against the Calgary Stampeders at BMO Field in Toronto on June 23, 2018. Former CFL head coach Marc Trestman has joined the upstart XFL. The league announced Tuesday Trestman had been named the head coach/GM of the new franchise in Tampa Bay. 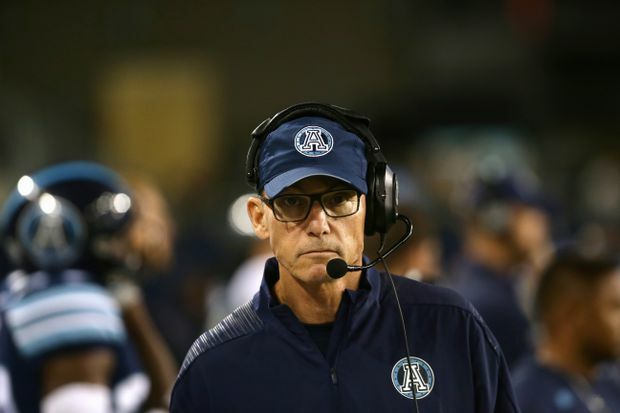 Trestman, 63, spent the previous two years as the Toronto Argonauts head coach. He led the franchise to a Grey Cup title in 2017, but was fired after last season when the club finished last in the East Division with a 4-14 record. Trestman’s first CFL stint was with the Montreal Alouettes (2008-12), where he won two Grey Cup titles (2009-10) before becoming head coach of the NFL’s Chicago Bears. “I am very excited to be on the ground floor with Oliver, his team, and the other coaches across the XFL to help re-imagine football,” said Trestman. “I started my coaching career in Florida while I was in law school, and personally know the passion and love for the game that football fans have in the Tampa Bay area and across the state. Trestman joins Bob Stoops (Dallas), Pep Hamilton (Washington) and Jim Zorn (Seattle) as the XFL head coaches named to date. Trestman was named the CFL’s coach of the year in 2009 and 2017. Trestman also has the distinction of having coached an MVP in both the NFL (Oakland’s Rich Gannon, 2002) and CFL (Montreal’s Anthony Calvillo, 2008-09). He began his coaching career in 1981 as a volunteer assistant coach at the University of Miami. In 1983 he was elevated to the Hurricanes’ quarterbacks coach as Miami won its first NCAA title. His college coaching resume also includes two seasons as offensive co-ordinator at NC State (2005-2006). A Minnesota native, Trestman earned a B.A. in political science from the University of Minnesota and a J.D. from the University of Miami Law School and has been a member of the Florida Bar since 1983.